Twenty one electric vehicle sites, branded Z.E. Expert, are now live and ready to offer the full range of sales and after-sales services for Renault's electric vehicle customers, with each one having benefited from a comprehensive sales staff training, site upgrade and infrastructure programme. Each dealership will be able to handle potential EV customer questions, as well as offer advice on making the most of the benefits of running one, including the essential environmental and financial factors to take into account. Trained Z.E. sales specialists, a minimum of two per showroom, will also be on hand to guide interested private and business customers through funding and charging options, as well as battery hire plans to allay any potential concerns over powertrain replacement costs and performance. All Z.E. Expert sites have a Kangoo Van Z.E. demonstrator, so that members of the public can experience for themselves the smooth, silent and serene feeling of driving an electric vehicle. On the service side, workshop staff at each site - a service manager and two technicians - have undergone specialist training so that they can address the demands of the new technology and become familiar with the new tools they have been provided with. The dealerships have also purchased specialist ramps and equipment to deal with the service and maintenance of its electric vehicles, which attract no benefit-in-kind taxation and 100% capital write-down allowance in the first year, as well as being Congestion Charge and VED exempt. Additionally, Z.E Expert dealers have invested substantially in three new Chargemaster charging points with UK preferred partner, British Gas - one each for the workshop, demonstrator area and car park. The charging point in the car park will be accessible for all customers to use. There will also be a dummy domestic charging point in the showroom to provide demonstrations to customers. Commenting on the launch of the first set of Renault Z.E. 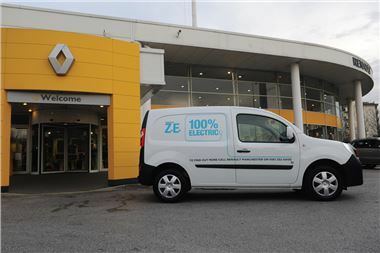 Expert sites, Thierry Sybord, Managing Director, Renault UK, said, "I'm delighted to see so many of our dealers embracing this new era of electric transport. With a full range of four fully-electric models set to launch in the UK in less than one year, we have high hopes for our Z.E. range. I'm sure our Z.E. Expert dealers will reap the rewards on both sales and after-sales and we look forward to charging ahead with them in the months and years ahead as we seek to attract as many electric vehicle buyers as possible." Supporting the on-site facilities, Renault has launched a series of other resources to help would-be-EV drivers become fully au-fait with the facts of living with a Z.E. product. Among them are expert Z.E. Live text chat or one-way video, including video guides via www.renault-ze.com, plus a UK freephone service on 08000 72 33 72. All Renault dealers outside of the 21 specialists have been given a Z.E. induction and will also be able to handle enquiries and refer customers to a suitable member of the Z.E. Expert dealer network.